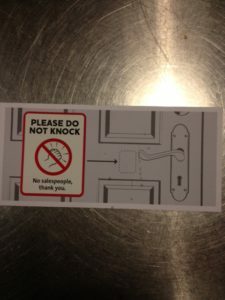 Our Do Not Knock stickers have been flying out the door thanks to the publicity of last month’s Federal Court’s decision which found that salespeople who ignore visible Do Not Knock stickers are breaking the law. The Australian Consumer Law provides a maximum penalty of $50,000 for companies who break this law. 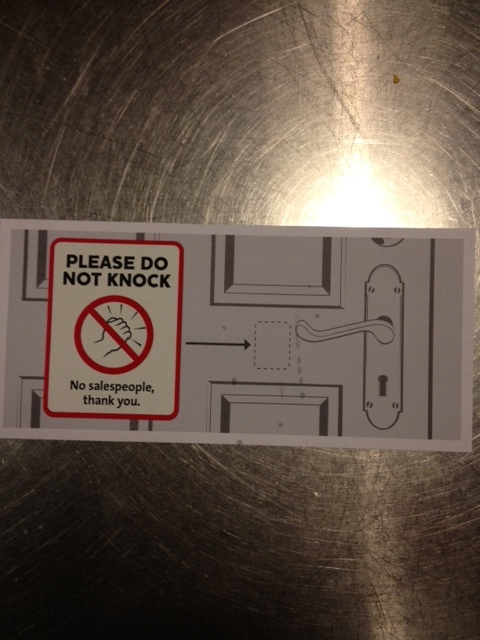 It can be surely no coincidence that one energy retailer has again started distributing their own Do Not Knock stickers. 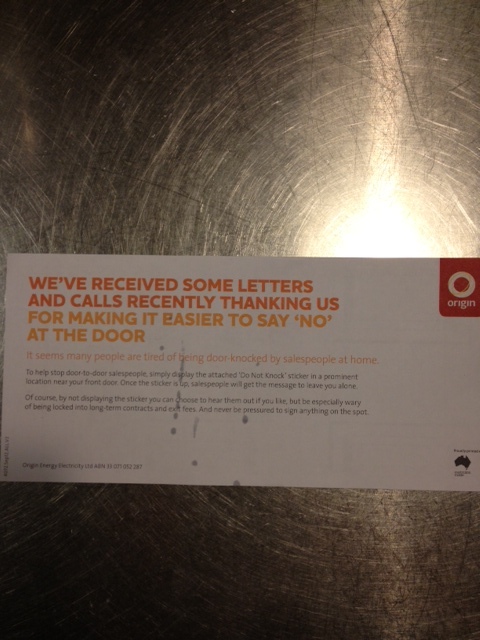 More than one campaign supporter has told us that Origin has sent them a with their latest bill – with a note that acknowledges that consumers may be tired of door to door selling. This is more than a little ironic, given that energy marketing leads to over half the complaints we get about Do Not Knock stickers being ignored, and related breaches of the Australian Consumer Law. 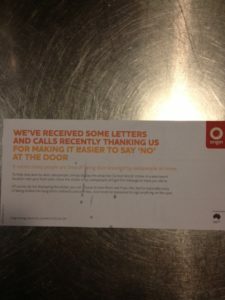 While we applaud efforts of energy retailers who are empowering consumers by distributing stickers, we’d like some assurance from the industry that they’re putting as much effort into making sure that all their salespeople respect Do Not Knock stickers, and all other requirements under consumer laws. Ideally, we’d like to see retailers take a stand against poor selling practices and announce they are stopping the practice of door to door selling altogether—a suggestion we made to seven energy retailers earlier this year. So far, none of them have agreed to do so. The door is still open for retailers who want to do the right thing by Australian consumers and stop door to door selling—the question is, are they willing to take real action that will stop causing problems for consumers? Has your energy retailer sent you a sticker recently? If so we’d love you to send a copy to campaigns@consumeraction.org.au or tweet it to us @consumer_action . And remember, if you want to complain about your sticker being ignored, use our Make a complaint form.